Got an online course that isn’t selling? Or are you looking to create a course sometime soon? After all your hard work building an online course, the last thing you want is for visitors to land on your sales page and think “that's not worth it”, close the tab and never return. Instead, you want visitors to immediately grasp the value of your course and see that it’s worth the investment. As a marketer, this means you want to increase the perceived value of your online course in as many ways you can. Well, here are 6 ways that you can quickly raise the perception of value for your online course. Since an online course is not a tangible thing you can hold in your hands, it can be difficult for customers to perceive its value. Sure, they’re signing up for a course, but all the lessons and training materials exist online and that can decrease the perception of ownership. But that doesn’t mean you shouldn’t help your customers visualize what they get. Before videos were hosted online, digital courses were often sold as a set of DVDs that would be shipped to customers. These courses would include a box shot: an image of the box that would be sent to them with the contents of the box laid out. Now with courses hosted online, the new ‘box shot’ is an image of the course interface and videos loaded on different screens. By showing the course being accessed from different devices, you are inviting your customers to grasp the idea that the course is versatile and easily accessed through their chosen device. Our favorite service for creating a product image is Place It. They have over 200 template product shots that incorporate multiple devices, and a simple to use interface. After selecting the product shot template, you can upload individual images for each screen until you're happy with the design. Select the ‘Multi Device’ filter for the best online course box shots. Once your box shot is looking right, you can pay a single fee to download the final image. And what does it all cost? Only $8! Merely watching a series of videos or reading text isn’t necessarily the best way to learn. For most students, taking some form of action is really what makes the information stick. But with an online course, how do you create active tasks for your students to take? By providing some kind of workbook, you give your students a tangible activity to apply their knowledge. Your students get to take an active approach in their learning rather than just passively listening or reading. But once again, you probably want to avoid sending physical workbooks through the mail. Instead, create digital workbooks for your students. There are a few ways to create workbooks. The most professional — and therefore expensive — way to create your printable PDF workbooks would be to hire a designer. Fortunately, the average workbook won't require high level design skills. Since they are mostly made of text and questions, you should be able to get one made for a small fee through Fiverr so long as you supply all the details. Still, there are much easier ways to achieve similar results at far less cost. 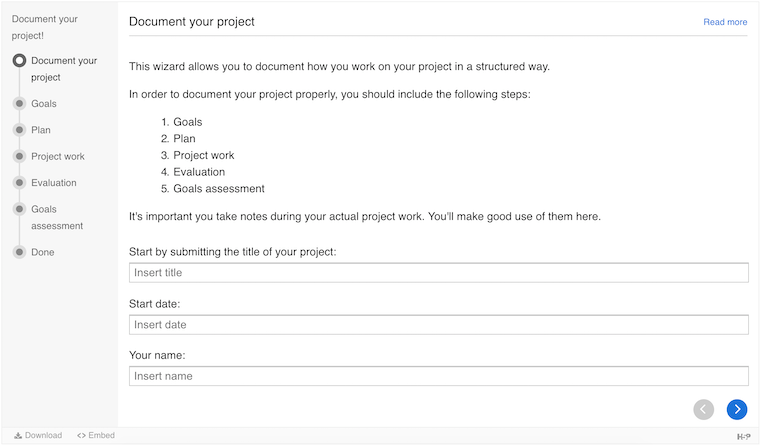 Google Docs: Create a workbook document in Google Docs that you can share with your students. After creating the document, you can select ‘share’ and then choose the option ‘Anyone with the link can view’. This means that students are not able to modify the original document. You don’t want them filling out answers that all students can see. By providing this link, students can view the document. You then need to inform them to click ‘file’ and ‘make a copy’ if they have a Google account, or simply ‘File’ and ‘download as’ to save it as a PDF or .docx file. 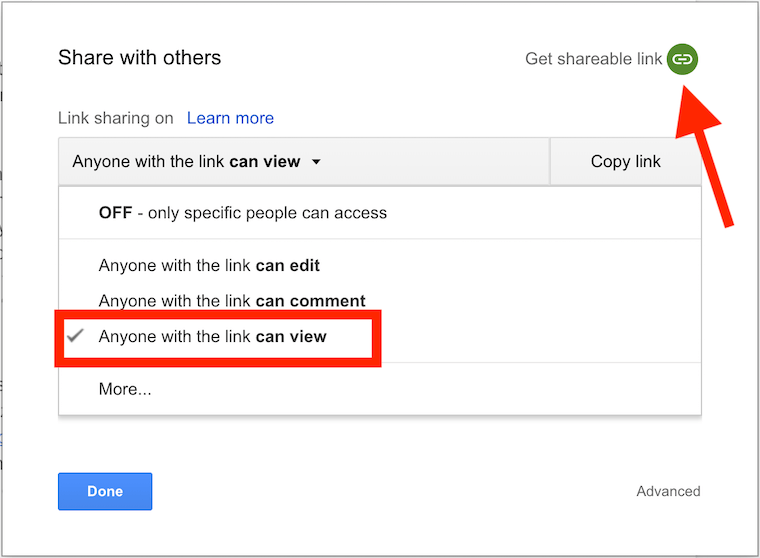 Once permissions are set, share the link from inside your online course pages. If you go down this route, check out our post on Content Box templates that you can use for your online course. You can easily use these to create Workbook Download buttons. Interactive Workbook Plugins: There is a free, open-source plugin for WordPress called H5P that allows you to create questionnaires, tests, assignments and interactive content, with downloadable results. Have a look at their Content Types and Applications to see what you can create. The ‘Documentation Tool’ is particularly useful, and allows you to create questions and note-taking spaces that, once answered, can be exported as a .docx file for the student to keep. With H5P you can create interactive work documents. If you're looking for a platform where you can create and sell beautiful online courses and information products, then check out our free Thrive University course on How to Build an Information Product Empire You Actually Own. We'll show you a new integration we've recently released and how it compares to other options on the Online Course creation market. Think about the film industry for a moment. If you rent a movie, you’ll expect to pay a lot less than if you own it permanently. The difference is that if you buy the movie, you know you have access to it for life and can re-watch it as many times as you please. Yet to the distributors of the movie, there is no (or very little) additional cost in selling their movies rather than renting them. Fortunately the perceived value of ownership is far greater than that of a single viewing. It’s the same with your online course. Permitting your students to access your course content anytime they wish is a great value bonus. Potential students and course customers may be concerned they don’t have the time to complete your entire course right after signing up. Giving lifetime access permits them to retake your course as a refresher any time they please. There are some legal concerns with providing Lifetime Access. How long is lifetime? Is it your lifetime, or theirs? The solution to this is pretty simple: you need to declare what exactly lifetime access means inside your Terms & Conditions or Student Agreement. But don’t be shady about it. Technically you could state that Lifetime access is only a year or two, but most students would consider that to be misleading. What I recommend is a clause in your Terms & Conditions that states that Lifetime Access is a certain number of years (be generous, make it 5+ years, or even 10) and that if for some reason your website needs to be taken down, then course videos will be made available for download to students for 3 months after notice is given. 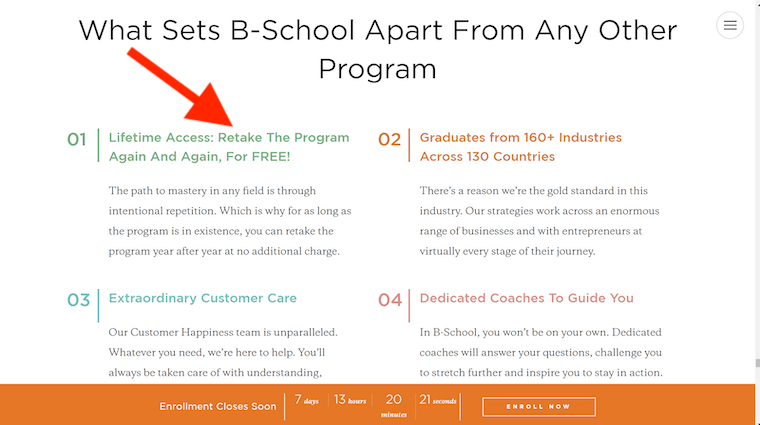 Marie Forleo's 'B School' sales page lists the benefits of Lifetime access. Which of these two course settings do you perceive to be more valuable? 1) In person, face-to-face teaching in a classroom. At face value, people consider in-person teaching to be worth more. To know that a teacher is present to take questions and directly address students carries a lot of weight. Ironically though, online courses tend to be more versatile in that they can be taken anywhere, any time of the day, and lessons can be paused and rewatched at any time. Combining the best of both will get you the greatest perception of value. By creating the core lessons in a video format, you can invite students to take the course in their own time. But by offering a live or interactive element, you invite them to bring their questions to you and explore them directly. If you can break out of the perception that your course is just a simple video series, you’ll do much more to increase its perceived value. There are 3 easy ways to provide live or interactive teaching with your students. Create a Members Area: This could be a Facebook Group or a Buddypress forum that is only accessible to students. 1-on-1 Coaching: You could provide a 45 minute coaching session for each student that signs up. This can be scheduled with Calendly and then the sessions handled through Skype or Zoom. Check out this ActiveGrowth post Matt wrote on using Calendly for your business. Students-Only Webinar: A live video that allows you to take questions and answer them in a video stream. You can create your own live webinar room with Thrive products by following this simple Thrive University course. Or, if you do have a private Facebook Group for students, you can use Facebook Live inside the group. Text-only courses just don’t have the perceived value that video courses do. Why? Because in the age of internet, answers to anything and everything are available in text form via a simple Google search. People aren’t used to paying for written text anymore, at least not short form. They might pay for books or PDFs, but even then they expect to pay a limited amount. How would you feel if you signed up for an online course for $497 only to find that it’s purely text? It somehow doesn’t feel right, does it? For this reason, if you’re hoping to charge a decent price for your online course, you need to create video lessons. So much more can be taught when body language and vocal inflections influence the information. But don’t stop there. Some people learn from video, others from audio, and others just by reading. By offering your lessons in multiple formats, you invite your students to consume your course in the way that suits them, whilst greatly improving the perceived value of your course. Ramit Sethi's 'Mental Mastery' sales page explains the multiple formats. Most video editing software allows you to export Mp3 files from your videos. This will be your audio-only version. You then need to embed an audio player or link to the audio file from your website, and once again you can use our Content Box templates for online course creators to do this. 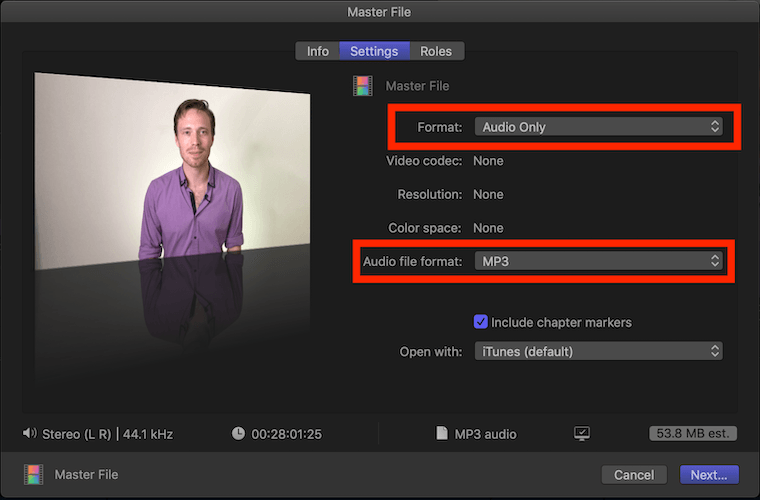 Final Cut Pro X for Mac allows you to export audio only from video as MP3. Audio and Video content should never be hosted through WordPress. If you do, you’ll quickly exceed your hosting bandwidth when anyone consumes them. Instead, you should host video with a service like Wistia and audio with a service like Soundcloud, which both provide players that you can then embed on your website. With Soundcloud, you can upload audio files and set them to private. That way you can embed them inside your lesson pages where they can only be accessed by your students. The audio files will not be available anywhere else online, so you are safe knowing no-one can steal access. Adding audio lessons to a video course or any multimedia to a text course will improve the perceived value. If you haven’t got the ability to create an entire video course, at least supplement it with 1 or 2 videos. For example, in this post about using free content to promote your online course, I looked at Nathan Barry’s product, the App Developers Handbook. It’s just a simple PDF handbook, but by supplementing it with a collection of video lessons, Nathan increased the price from $39 to $249! A well-made online course has a structure. It moves students from their initial problems towards attaining one large goal by breaking the information up into individual lessons. But even before you’ve sold your online course, potential students will still be unsure about signing up. They’ll always come up with reasons why the course isn’t quite right for them. This is where bonus modules can help. A great bonus module will directly address a customer’s fears regarding your course. It’s extra content that, when listed on your sales page, shows customers how their concerns will be specifically addressed. Not only will they learn ‘X’, but they’ll also learn ‘Y’. What is the number one fear or concern your customers have have when it comes to signing up for or buying your online course? Is it that they aren’t good enough? Don’t have the time? Are too old? Create an additional module that specifically addresses this and makes it apparent in the title of the bonus module. Let’s say your online course is about how to use Photoshop. Your additional bonus content might be “Bonus Module: Getting Up To Speed with Photoshop when you’re over 55 years old”. It may sound bizarre to get so specific, but if people over 55 happen to be your target audience and tech literacy is their number 1 concern, then that bonus module will greatly increase the value of your course for them. Get Started, and then Get Better. Here at Thrive Themes, we consider perfectionism to be the enemy of progress. That’s why we created free trainings like our Rapid Landing Page course to get your website converting quickly. It’s more important that you get something done and shipped than waiting for perfection to materialize on your first try. Each of the above 6 steps discussed above might take you a bit of extra time to add to your course, but implementing them will definitely raise the perceived value of your course the moment they are added. As you introduce the above elements, you can then update your sales page and potentially even increase your pricing. And don't forget to check out our latest course on How to Build an Information Product Empire You Actually Own. Are there other features of online courses that helped push you to buy in the past? Tell us what’s made an online course look super valuable to you in the comments section below! Brilliant Brad. Thank you so much. I feel much more confident about giving my online course a go now…and how to market the detail and benefits. Well done and thanks for sharing. I have marked this to do for the new year now! Excellent post. Perfect timing as well! This article could actually be a bonus module for a course. I hadn’t thought of it like that but now I like the idea that our blog is an endless bonus module! I’m a Course Craft student and was thinking the same thing. I just revised my US & EU price tables. My content was good before but Bradley’s explanations helped me take it to another level. PS: This took at the most 2 hours (1hr, 45 min studying, thinking, writing, and 15 minutes updating my US & EU pricing tables). Bradley, all your posts have been super valuable to me. Thanks! Thrivethemes, great job as always. Timely, valuable content and easy to use feature-packed tools. You rock! Some great suggestions! Something that I also like in courses is quizzes. A nice, interactive way to test your knowledge and keep students engaged. I’m adding them to my course soon :). This article contains very important ideas that every course developer should seriously consider. Bradley, you hit the important points and you did it in a condensed, short, and easy to read way. AND you tied in several of the other Thrive Themes ideas from other articles. This is definitely worth a second read. Thanks Brad! These are some great suggestions! I have a question though. I am a thrive themes member and I’m in the process of redoing my membership site but I’m having some problems. I want to use thrive apprentice but I think I’m stuck! In my members area I want to have several things for instance a recipe library with categories but allow people to search and filter through them with tags. I don’t think apprentice can search within the course though? It only search the title of the course which is useless to me and it only let’s me use one Tag for a course and not a lesson. On top of that I want to have other “courses” or traings with our recorded live Q and A. So people can search questions/ topics they have. And also have the normal course module trainings. I don’t know how I can set this up with apprentice it just seems really limited. Any suggestions? Do I just need to make these blog posts and protect it? I have no idea how to move forward. Thanks in advance! Hi Jorden, it sounds like you’ve got some great ideas for what you’re trying to do. I love the ambitiousness! For a recipe library, that sounds like it’s best served as a blog-style list sorted with categories and tags. It may require some work in WordPress but it wouldn’t be impossible to create a separate posts list (one for regular blog and one just for recipes), and then use your membership plugin to protect those posts. Alternatively, you could create those recipes as separate pages and then use Thrive Architect to create links to all of your recipes. This could then be added to a lesson inside of Apprentice, so your members can access the link directory you’ve made. As for the search function, I’m not knowledgeable enough on how that works inside of WordPress. But you could open a support ticket and our support team could point you in the right direction. They’ll understand how search works better than I do. Another way to create workbooks — which I’m doing as I type this message — is to use Google Slides. Go to File > Page Setup and set the size as a standard printer-sized paper (8.5″ x 11″ for me in the U.S.). Each slide is a page in your workbook. This way, you’re not constrained by the linear nature of a text document and you have more design freedom. 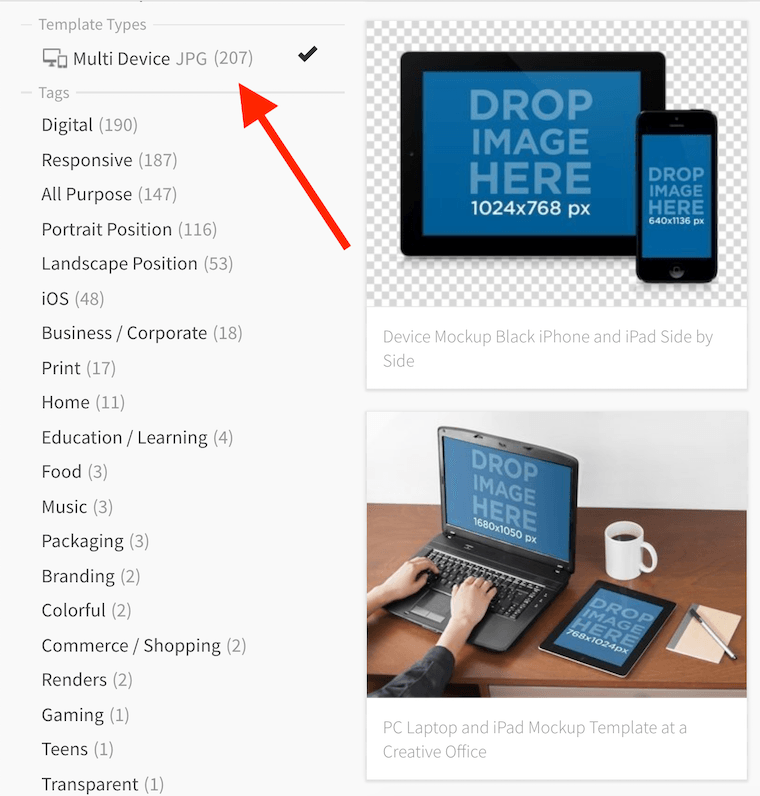 When you’re done, go to File > Download as … > PDF to export the PDF you’ll share with your students. This is a brilliant idea, Matt. I didn’t even think of Google Slides and didn’t even know you could set it to standard paper size, but it certainly adds more visual elements than regular Google Docs. Thanks heaps for the suggestion! You’re welcome, and thanks for sharing our content, Rob! Hey Brad! Superb suggestions. Can I suggest to the Thrive team that this post gets added to one of the courses on course creation inside the University? Good idea, Martin! I’ll see if there’s a good course for it and perhaps add it as a final module. Awesome post! One question: The H5P plugin you mentioned looks great. Can it be used with Architect? Probably not eh? It is such a versatile plugin that it would be a shame not to be able to use it with Architect. I can see so many ways to use the plugin. Anything you can do to make your site interactive would be awesome. It could lower your bounce rate significantly. It sure can! You can build interactive questionnaires in H5P and then it will give you a shortcode. You can load that shortcode on any Thrive Architect page, just by placing it in a regular paragraph element. Once you preview the page, the shortcode will be replaced with the questionnaire! So simple. Occasionally people request that we make software that replaces WordPress. But WordPress is amazing (even if it’s not the most intuitive at times). In Thrive Architect, we have a WordPress Content building block that is very versatile and allows you to get other plugins to show up inside your pages. That’s awesome! Thanks so much. I can’t wait to see what I can do with it. Testing this fancy comment situation. Pretty cool, huh? That’s Thrive Comments at work. Who ever thought that you could make a commenting plugin with a conversion-focus? Thank you for the blog post, as always, Brad. I have found some really good additional tools to use. Great suggestions! I’ve bookmarked a bunch of pages you mentions. I too am intrigued by Thrive Comments…. Glad you found something of value, Peti. I love Thrive Comments. I think the coolest feature is that you can create a bonus that people can only get once they leave a comment. It both encourages them to leave a comment which creates social proof, and it grows your emailing list by giving a one-time incentive right just after. So many great tips. It’s really motivates me to get started on developing my first course, knowing all these elements are available. And I definitely will try h5p documentation function. I hope you do, Leigh, and good luck! Great article, thanks a lot, Brad! Very useful! such a great post with so many great ideas. I’m guessing, testimonials can also be added to increase the value of a course? Thanks for sharing Bradley, your posts are so helpful. Ya know, I was extremely close to mentioning Testimonials in this article but decided against it. I think it’s slightly different. Everything I mentioned here is about increasing the perceived value, but you would use testimonials to decrease purchase anxiety. One is adding positives and the other is subtracting negatives. So although the end result is the same (someone buys the course) the purpose is a little bit different. But yes, definitely include testimonials on your course page! The post mentions using buddypress to add value. I’ve been considering adding Buddypress to a site I have Performag installed on. Are Thrive Themes Buddypress compatible? Or is there a stylesheet that is going to make the member profiles look nice? Hi Troy, I checked with our Support team. Yes, Thrive Themes are BuddyPress compatible, and there aren’t any conflicts that we know of. We’ve got many users who are running BuddyPress with our legacy themes, such as Performag. But we don’t have a specific stylesheet, so it will be the default BuddyPress styling unless you make changes yourself. This is excellent. I’ve already implemented some of these, but this article needs bookmarking for sure. This was really helpfull, need to make a new sales page for an upcoming course. You gave me a lot to work with. Thanks! I’m pleased to hear that, Jeannette, and all the best with building your page. Thanks for sharing these amazing tips, Brad :) Some sort of a money back guarantee is also pretty effective in closing the deal. Sure is! Thanks for stopping by once again, Baidhurya! Just brilliant! Thanks a million. Hi, Brad-wasn’t very aware that TT offered So Many Value posts until recently. And yours doesn’t disappoint! Not at the ‘course level’ yet but I sure took a lot of notes! Unfortunately, you’re competing with Kajabi; would have really appreciated it if you had addressed that. But your post helped a ton since I’m in the midst of preparing video + pdf lead magnets to optimize more virtual & dynamic interactions! I’m a 100% total fan of TT’s posts and emails. Yes, we always aim to create awesome content for our blog. If you’ve just discovered it, you’re in for a treat! I don’t have much to say about Kajabi, except that their middle tier price (which removes branding- essential in my opinion) costs $159 p/m whereas the entire Thrive Themes membership costs only $19 p/m… and we don’t lock you in to a platform.